Need some help? Check out this tutorial! 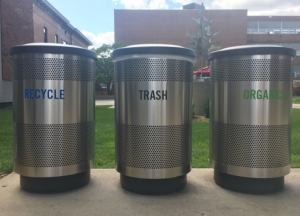 In 2016, Augsburg began a campus-wide composting program, thanks in part to a $50,000 grant from Hennepin County and matching funds from the student Environmental Action Committee. Since then, A’Viands Campus Dining has transitioned to certified compostable containers and silverware for food service and catering, our Purchasing department has helped make compostable materials more available to campus departments, students committed to a system for composting and recycling in every single dorm room starting Fall 2017, and everyone around campus has been learning together how to actually use those green bins. Environmental Action Plan Goal 3: Cultivate personal ownership and a community culture of environmental stewardship. 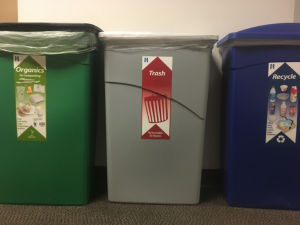 You can find a green compost bin next to all the recycling and trash bins in central locations inside and outside of each building, including the dorms. Any other food you don’t eat!! 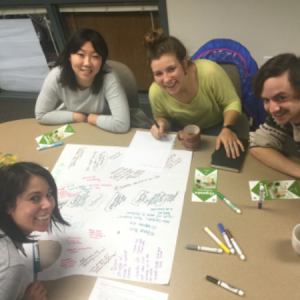 Contact our Environmental Stewardship Intern Team to see how we can begin a compost collaboration!